This book called out to me when I saw the cover and read the title. I am one of “those people” that has boxes of recipes from my Mom that need to be organized. I have the ones I truly treasure at this point, of being without her for over 9 years, that were written by hand. Just seeing that old familiar handwriting can take you back in time with just a glance. Then of course are the ones she cut out of magazines thinking to try someday. In reading this book, I got some really good ideas on preserving the recipes, in particular her hand written ones, and some good points of how to showcase them. Some choose the recipe boxes, other binders that can be easily reorganized, and then others photo albums, etc. 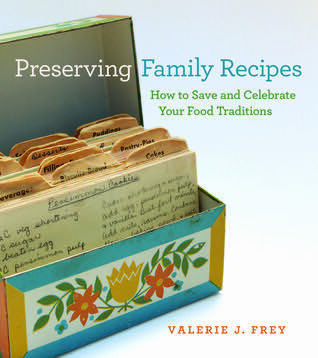 I enjoyed the preservation and display info, and I enjoyed the writers stories throughout of her grandparents and parents through recipes that meant a lot to her. I did feel like there was a lot of filler in the latter chapters. I got the most personally out of Chapters 1 through 3 and Chapter 7.